We all have limiting beliefs that prevent us from attracting what we want in life. They are so powerful that no matter how hard we try to control our thoughts or emotions, we still can't manifest our dreams. 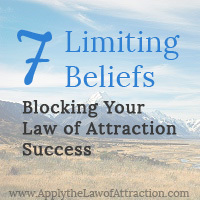 It isn't until we dissolve these limiting beliefs that we achieve the Law of Attraction success we want. Limiting Belief #1: I have to be good. Every time you seek approval of someone else, you're blocking your natural attractiveness and you're not allowing yourself to know what it is you truly want from life. Remember that when you are your true self, life just works better. You naturally draw to you people who realize how awesome you are. You magically attract opportunities to help you manifest your dreams. You say yes to success! Limiting Belief #2: I'm not good enough to get what I want. If you're constantly criticizing yourself or working on yourself to make yourself better, you're sending out a message to the Universe that you don't believe in your ability to attract the health, wealth, and success you deserve. If you expect to never get what you want in life, that's exactly what you will attract. Change your mindset by enjoying your life right now. Visualize a new, more relaxed and open version of yourself. Step into that version of you. Play with what it feels like to be him/her. Even if you have a lot to learn, realize that it's what keeps life interesting! Limiting Belief #3: I have to suffer so others can be abundant. Sometimes you suffer so much that you aren't helping yourself – or others. Even if you make it easier for others to be abundant, you can't make them abundant. While they may have gifts you don't, you also have gifts that no one else has. When you shut yourself off from these gifts, you deprive everyone, including yourself. When you place others first and take on too much, it's normal to feel resentment, helpless, overwhelmed, and lonely. You can overcome this limiting belief by practicing loving kindness towards yourself. Find your place in life. Be openhearted and connect without losing yourself. Take time to relax and enjoy the comforts of life. Limiting Belief #4: There isn't enough for everyone. You might feel that there isn't enough for everyone and so you have to rush to take what belongs to you…. Or you might believe that there isn't enough for everyone, including you, so you can't have what you want – either there isn't enough to go around or you'll be taking from someone else. This can apply to anything: money, time, jobs, single men/women, or something else. Often the limiting belief that there isn't enough for everyone comes from fear. And, most likely, it arises when you wonder how something will happen – How will you get the money? How will you meet him? How will the interview go? Every time you say there isn't enough, you manifest experiences where there isn't enough. You have the power to change that! It's your choice to see that you are an infinitely powerful being in an infinite Universe. Asking yourself what you want and why you want it connects you with joy and the ability to create what you want in life. Remember how connects you with fear; why connects you with joy. Limiting Belief #5: It has to be like this. When you tell the Universe how something has to happen, it's a clear sign of a limiting belief. For example, if you want to attract a relationship with a specific person, but you tell the Universe he/she has to send you a text message saying x, y and z; then call you every night for three nights in a row before…. You're not attracting a relationship. You're attracting text messages. You're attracting 3 phone calls. But a relationship? 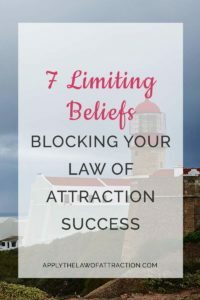 Nope, your limiting beliefs are blocking you from one. This belief also comes up if you think you're the only one who knows how to do something or if you think your way is the only way. They are all limiting beliefs focused around control. You probably notice a lot of tension in your body, you may be suppressing your emotions or holding back, or you're constantly watching what either you or others are doing. You can overcome this limiting belief by seeing life as one big party where the only thing expected of you is to have fun. Be open to any help that the Universe might provide to you in manifesting your dreams. Listen to your intuition to show you the best thing to do in any moment. But, most of all, relax and have fun! Limiting Belief #6: I have to be who I'm expected to be. It's draining and overwhelming to have to always meet others expectations. You might feel resentful, guilty, or trapped. You may act out with addictions (drugs, food, gambling), financial debt, or extra weight. What you need to realize is that you are a part of what has created the life you are living. If you focus on sacrificing yourself to meeting others expectations, you will continue to create a life where you have to place others first or you have to make up for not being enough. It's time to take back your power! Your value lies in who you are, not in another's expectations. Change your mindset by enjoying your life. Find ways to express yourself – dance, art, music, saying yes/no… Let go of the rules and follow your inner guidance. Give yourself space to heal emotionally and physically if you need it. Limiting Belief #7: I have to work hard to succeed. It's true that you have to take action to achieve your dreams, even when using the Law of Attraction. But it shouldn't feel like a burden, time pressure, or an invisible force keeping you stuck where you are. If you expect to work hard to be successful, odds are that's exactly what you'll attract. Allow everything you do to be joyful and easy. I love your website Elizabeth!!! Are you on facebook so I can follow you? You can also sign-up for my newsletter (blue bar at the top of this page) if you would like to know when new articles are posted. Hiee elizabeth i just love your blog .it has helped me so much .i have manifested so many things . I read your post about the manifesting box . I write my wish in present tense . Is it okay ? Can i use it to manifest a specific person . I am trying to do that and i have writen my wish as if i already have that and it has cleared all my resistance completely . I feel completly relaxed and feel like its already done . I dont even feel the need to sit and vishualize because it feels like i completely have it .i dont even miss him because its like i already have got him . Am i doing this right ? Elizabeth explains how to attract a specific person in her book Manifesting Love. It’s really good. I’m sure it can help you. It’s okay to write it in present tense. Hi, Elizabeth! I just wanted to tell you how much I love your blog; you’ve made me a firm believer in the Law of Attraction. I’d attempted to use it in the past, but it “didn’t work.” I didn’t realize that I was preventing it from working because of my Limiting Beliefs. Back then, I was very hard on myself, doubtful, depressed, and subconsciously, I didn’t believe I was good enough or worthy of my desires. So, of course, it wouldn’t have worked. Since then, I’ve been dealing with my depression, and I see things much differently than I did before. For the past week, I’ve been applying your techniques (which are wonderfully simple and easy to do), and I’ve been getting amazing results! It’s almost like magic, and it gets easier everyday. That’s fantastic N! I’m so glad it’s helping you. Thanks for letting me know!